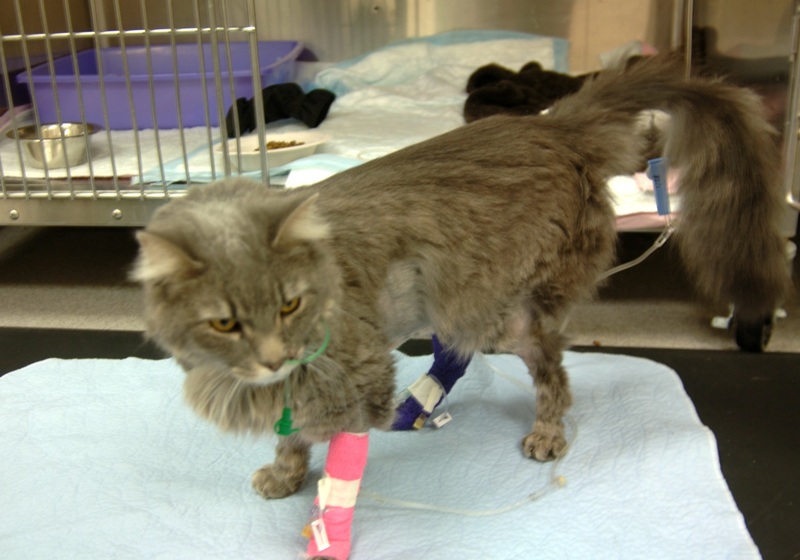 Once Phoebe’s owners, Michael and Christina Weller, noticed how sick their cat was acting, they took her to their local veterinarian, who referred them to the University of Missouri Veterinary Health Center. This is where they were informed that because kidney failure had progressed (despite rigorous treatment), the only hope for Phoebe would be dialysis. Even with dialysis, there was only a 50 percent chance of saving her, the Wellers were told. To top it off, the closest veterinary hospital that offered dialysis treatment was eight hours away, at The Ohio State University Veterinary Medical Center. This didn’t stop the Wellers, who immediately drove Phoebe to Ohio overnight. Only 22 veterinary hospitals in the U.S. and 40 worldwide offer dialysis services said Dr. Catherine Langston, associate professor, service head of small animal internal medicine and the veterinarian who administered Phoebe’s dialysis. When the Wellers first arrived at Ohio State on Jan. 18, a blood test revealed that Phoebe’s creatinine levels - an important indicator of kidney health – were at 14 mg/dL, which is 10 times higher than it should have been, according to Dr. Langston. First, Phoebe got a blood transfusion. She was quickly placed on dialysis a day later, and the results were immediate. After a total of two dialysis treatments and a week of recovery, her creatinine levels were back at 3 mg/dL and slowly leveling out. Phoebe was taken back home on Feb. 1, and is expected to live a long and healthy life. “She’s basically back to her normal self,” Christina Weller said. It’s unfortunate that lilies are common houseplants, and are often included in various floral arrangements without identification. It should also be noted that the entire plant is toxic to cats, including petals, stamen, leaves and pollen.